I must admit, until this year I hadn’t watched one episode of I’m a Celebrity ‘Get Me Out of Here’. I’d heard (mostly) good things about it so decided this year to see what all the fuss was about. I wasn’t though expecting it to make me think about the industry I work in… Cybersecurity. I’ll be honest, I wasn’t expecting much from the programme, but how wrong could I be! 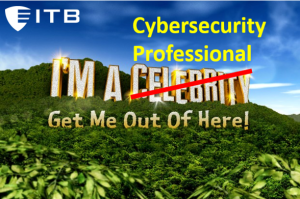 Whilst watching an episode last night it suddenly dawned on me that working in Cybersecurity is very much like living in the I’m a Celebrity Jungle. In the Jungle contestants are asked to complete a number of tasks, often under pressure, to gain small wins for themselves and the rest of the camp. The rest of the camp don’t know what’s happening during the tasks, but nevertheless reap the rewards. Now think about this from a Cybersecurity perspective. Cybersecurity Managers and Analysts are regularly completing a number of tasks, that the rest of the business don’t know about. They’re doing so often under pressure, for the greater good of the business. But the similarities don’t stop there. Usually the contestants in the Jungle are surrounded during the tasks by all manner of creatures. From Snakes, Scorpions and Spiders to Crocodiles and Electric Eels. Their concentration during the tasks must be unwavering otherwise only failure awaits. Now substitute all of those creatures for hackers, threats, vulnerabilities and alarms. All of a sudden you start to appreciate the difficulties an IT Security professional faces. Many of their tasks also take a great deal of concentration, often in the face of a huge range of distractions. These include multiple attempted external hacks, internal threats, newly discovered software vulnerabilities and working out which alarms need addressing and which are false positives. The organisation is addressing GDPR, SOX and NIS legislation. And this initial appreciation turns into a sense of respect. The truth is that working in IT is sometimes a thankless task. IT professionals are rarely thanked when things just work, however they’re the first to know when something goes wrong. It’s not all doom and gloom though. It’s an industry where the career options are limitless and it can be highly satisfying knowing that you’re making a real difference. So, next time you’re watching an episode of I’m a Celebrity spare a thought for our Information Security friends. They work around the clock, in a high-pressure environment to ensure your information is safe. Oh and one more thing…..help them out and think before you click!